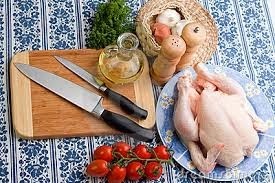 In this section of paleo cooking we would go into depths of properly cooking chicken, the paleo way. If you have been living in the suburbs all your life, chances are the only chickens you know are the commercial ones which you usually pick up from the supermarket when you go shopping. There are actually 3 types of chicken meat – the commercial type, the free range chicken, and the organic chicken. The commercial chickens are raised in large scales in overcrowded poultries or cages regularly sprayed with pesticides, fungicides, and herbicides. They are fed with grain based commercial feeds and their growth is enhanced with hormones and vitamin supplements while their health is fortified with antibiotics to guard against pestilence and disease. The free ranging chickens on the other hand, are always loose to freely roam outdoors. They are allowed to feed on plants and insects. They feed freely on their own scrounging for food in their natural habitat and allowed to grow on its own with no growth boosting hormones or vitamin supplements. Basically, they are also organic. The organic chickens are chickens raised in large numbers in wide but contained and controlled environment where they are allowed to also feed on insects and plants. They are given only natural organic feeds like vegetables but sans grain based commercial feeds. Their environment is pesticide, fungicide, and herbicide free. They are also not given antibiotics or growth boosting hormones. The chicken meat is low in fat and cholesterol but rich in protein and loaded with vitamins and minerals like niacin which is known to boost the good cholesterol (HDL) in your body, Vitamin B6 which helps convert carbohydrates into fuel, Selenium which is a known antioxidant, and phosphorous which is needed by the body for proper cell functions. Chicken meat is also a good source of protein. Here is a note of concern for you. If you don’t want to get traces of harmful chemicals as well from pesticides, fungicides, herbicides, and from synthetic food supplements and commercial feeds, it will do well for you to stay organic and stick to the Paleo food list. There are many ways of cooking chicken. It can be baked or boiled, fried, grilled or broiled, or used for soup or stew. But no matter how you want to cook it, it needs special handling prior to cooking. Raw chicken meat usually carries bacteria the deadliest of them is salmonella. If the chicken meat is left in the open in temperatures between 40 degrees to 140 degrees, the bacteria will multiply rapidly. Never leave it in the open at room temperature for more than two hours. And, you need to cook it thoroughly to get rid of all the bacteria. Make sure you keep it refrigerated if you are not going to use it yet. Put it in a sealed container so it won’t contaminate other food stuff in your freezer. Make sure you wash your hands thoroughly too after handling raw chicken meat and before you touch other food stuff. Clean and sanitize everything that had come in contact with the raw chicken meat including the sink and other kitchen surfaces. You can cook and eat beef medium rare or even eat it raw but not chicken. Chicken has to be thoroughly cooked. After cooking you need to check if the inside of the thickest part is no longer pink. If it is, you need to cook it some more to be sure it is fully cooked. You can keep cooked left-over chicken in a refrigerator for no more than two days after which you need to throw it away. Chicken meat dries up fast. If you want it to remain tender and juicy, it must retain its moisture. You can keep its moisture by soaking it in a brine solution for one hour. To make the brine solutions, simply mix 3 table spoons of rock salt with 4 cups of water. Chicken meat dries out fast during cooking. It has to be marinated to keep its tenderness and retain its juice. Marinating chicken meat also gives it flavor. It is an age old technique used to tenderize the eat as well as give it flavor and aroma. You should always marinate chicken in a refrigerator to prevent any bacteria from multiplying. Boneless and skinless chicken marinate faster than cuts with bones and skin still attached. Marinades usually use acids like lemon juice or vinegar as an added option if there is a need to tenderize the meat. The acid attacks and softens the tough connective fibrous tissues in between the muscles and tenderizes the muscles as well. Flavor can be anything from sour, spicy, sweet and sour, or smoky and sour depending on the ingredients used. For Paleo cooking, you should only use natural ingredients like organic vegetables, herbs, spices, cooking wine, etc. The longer the chicken is marinated the tenderer and the more flavorful it becomes. The basic marinade ingredients include vinegar, olive oil, pepper, salt, and herbs. For Paleo cooking, you should check what ingredients are allowed before using them. For example, you should not use refined salt. Instead, you should use natural rock salt. For some Paleo chicken recipes, rubs are used instead of marinades. Rubs are a mixture of seasonings like coarse peppers, garlic powder, paprika, and some herbs. They can be dry or in paste form. The paste blend is usually mixed with water, or oil, or horseradish, or other natural liquid seasoning to hold the mixture together. Like the marinade, rubs are used to add flavor to the chicken as well as to tenderize it. But before you put together your own flavorful rub you need to check if the ingredients you use are allowed in the Paleo diet. Another way of adding flavor to chicken is by using dipping sauces and basting. They not only preserve the moisture but also make the chicken dishes look more attractive. The ingredients commonly used for dipping sauces and bastings include gravy, barbecue sauce, natural meat broth, melted butter, garlic butter sauce and Fresh herbs can be added to the dipping and basting sauces for added flavor and aroma as well as for a more wholesome presentation.